Firehouse dinners – meet your local Firefighters up close and personal. Check back soon for more auction items! 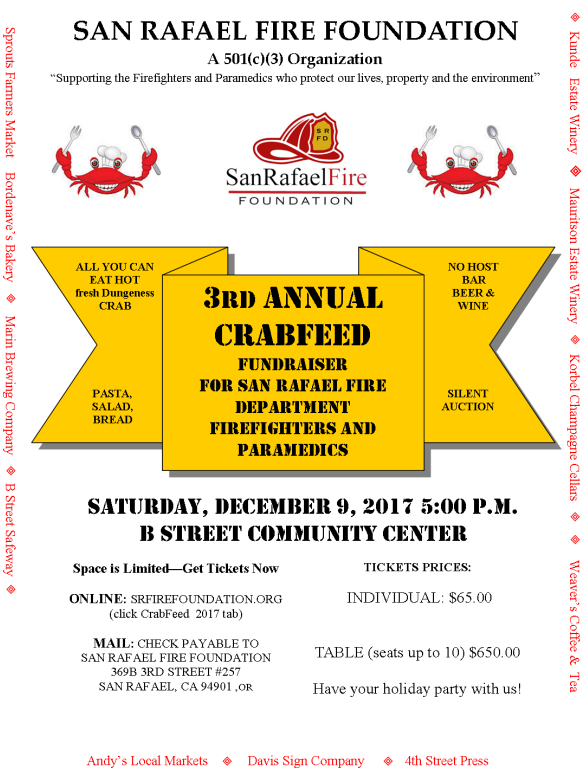 Join us for our 3rd Annual Crab Feed and Silent Auction fundraiser for the San Rafael Fire Foundation on Saturday, December 9. The event starts at 5 p.m. at the San Rafael Community Center on B Street. The silent auction includes great holiday gifts, including dinners at the Firehouse and a change to meet your local firefighters up close and personal. Tickets are $65 each or $650 for a table that seats up to 10 people. Saturday, December 9, 2017 5:00 P.M.